If you live in or near New York and have kids or young relatives (or can borrow some if necessary) then the New York International Children's Film Festival is always worth checking out. 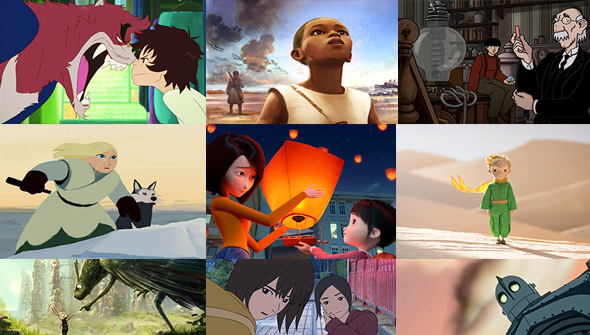 Established in 1997, the festival has a record for screening a great range of child-friendly animated movies from around the world. In fact, the festival essentially gave birth to the New York based distributor GKIDS, which was started by the festival's original founder in 2008. Which gives you an idea of the kind of quality of the animated offerings you can expect. This year's festival runs from February 26th to March 20th 2016, with screenings taking place at a number of NYC venues. This year the festival will open with Mamoru Hosoda's latest The Boy and The Beast, and will also feature early screenings of Adama, The Little Prince and April and The Extraordinary World. Highlights also include the North American premiere of last year's Annecy hit Long Way North, an intriguing Danish feature called Beyond Beyond and the first US screening of Chinese CG feature Little Door Gods. There are also a number of screenings of collections of shorts (animated and live-action). The full list of animated feature offerings are below. Book tickets to individual screenings, or purchase a pass at the festival's website.